If you’re not familiar with speculoos or cookie butter, you’re missing out. This growing trend started a few years ago and is now said to be one of Trader Joe’s best selling products. Some may argue that the popularity of cookie butter peaked back in 2014 but I see more of it now, especially in baked goods, than I did then. It’s a deliciously simple concept: ground spiced shortbread cookies and oil are made into a spreadable butter, similar to peanut butter or nutella. The idea seems to have come from Belgium and Biscoff was one of the first, most recognizable brands in the US. The dessert-like spread is a wonderful nut-free alternative for those with nut allergies and although it’s easy to eat by the spoonful or simply on toast, it turns out this sweet spiced cookie spread makes an amazing molten lava cake. It’s safe to assume that almost everyone is familiar with chocolate molten lava cakes these days. The rich chocolaty individual cakes with soft centers have initiated all sorts of spin offs. BuzzFeed even has a list of 15 Molten Lava Cakes You Could Fall Hard For, which includes butterscotch, dulce de leche, chocolate peanut butter, and even fruit based lava cakes. 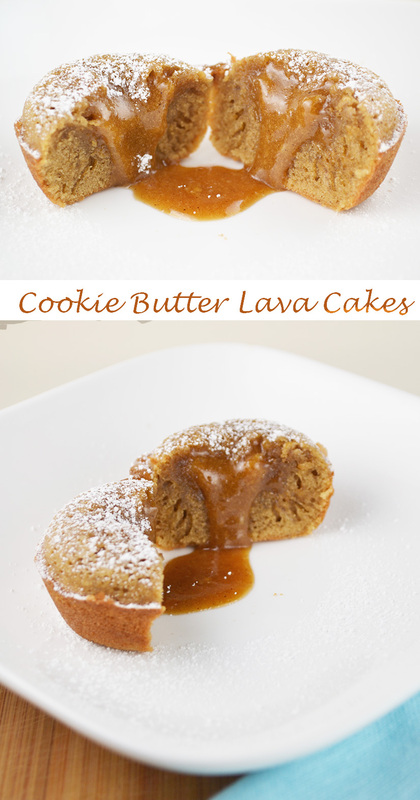 Cookie butter molten lava cakes are curiously missing. My previous attempts at baking with cookie butter have been disappointing at best. I often find that cookie butter tastes muted or dull in baked goods unless there is a high concentration of it. I’ve solved that issue here. These little muffin sized cakes are not only easy to make but chalk full of cookie butter flavor. 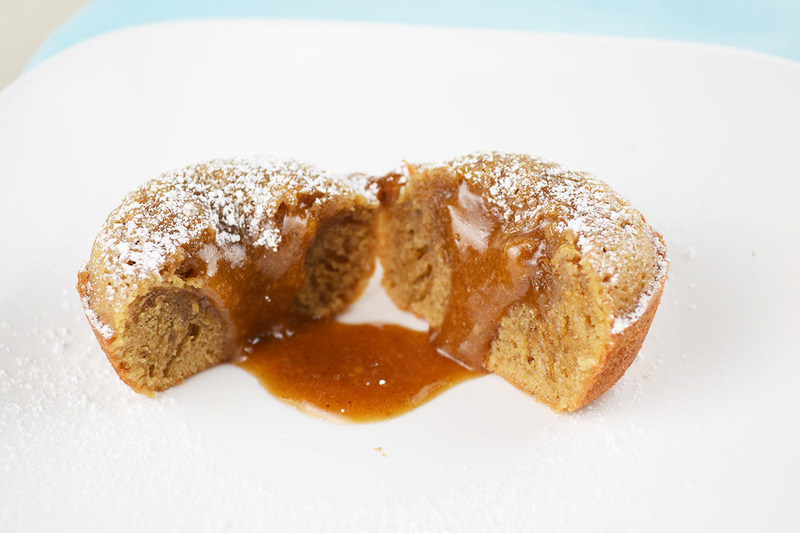 Moist cake surrounds gooey cinnamon spiced cookie butter lava that flows generously down the center when gently sliced. This indulgent sweet is every bit as good as the original chocolate version…and you don’t have to worry about accidentally burning anything (like melted chocolate). The molten center with the cinnamon scented cake is ridiculously tasty. Good luck eating just one. Preheat oven to 425 degrees. Grease and lightly flour a muffin tin. Melt butter with cookie butter in a microwave or in a small saucepan over low heat. Cool. Beat eggs and egg yolks with sugars until well blended. Mix in vanilla. Whisk butters into egg mixture. Add flour salt, and cinnamon. Mix well. Spoon or pour into muffin cups to about 3/4 of the way full. Bake for 7 minutes or until sides are cooked but centers still jiggle. Thanks Cheyenne! So happy you are excited about these. They are AWESOME. Full of cookie butter flavor. Enjoy! Thanks again for the great comment.